The forecast for both the weather and Wednesday's news cycle? Stormy. More on that and the other top communications news below. 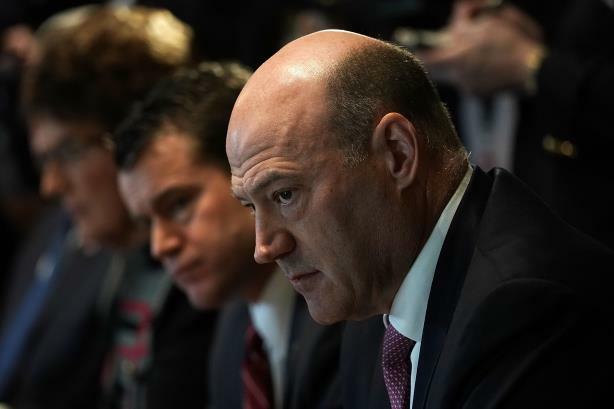 Wednesday morning’s big question: How will the markets react to the resignation of top White House economic adviser Gary Cohn? Not well, if futures markets are any indication (Quartz). Experts are predicting a Dow Jones Industrial Average drop of more than 300 points at the markets’ open (CNBC). Another Stormy news cycle for the White House. Adult film star Stephanie Clifford, known professionally as Stormy Daniels, sued President Donald Trump on Tuesday, saying a nondisclosure agreement with him is invalid because Trump never signed it. Trump is referred to as "David Dennison" in the original paperwork (NBC News). Meanwhile: the Justice Department has sued California over its immigration policy (New York Times). United changes course on ‘bonus lotteries.’ Seeing headwinds in an online employee backlash, United Airlines has pumped the brakes on replacing monthly employee bonuses with the chance to win $100,000 and other gifts. Employees signed an online petition and voiced their anger on the carrier’s Flying Together portal about the changes (NYT). Haiti is trying to boost its reputation in the U.S. Less than two months after President Trump reportedly referred to the country as a "shithole" in a closed-door immigration policy meeting with Senators, the country has hired Mercury to boost its standing in the U.S. (The Hill). Parkland students mock NRA spokeswoman. Marjory Stoneman High School student Sarah Chadwick and members of the #NeverAgain movement released an ad copying a recent spot starring NRA spokeswoman Dana Loesch. It has the same hourglass, but a very different message, warning the NRA its time is up instead of Loesch’s foreboding comments about politicians, actors, and "athletes who use their free speech to alter and undermine what our flag represents" (SBS News). "To every spokeswoman with an hourglass who uses free speech to alter and undermine what our flag represents...Your Time is running out. The clock starts now."